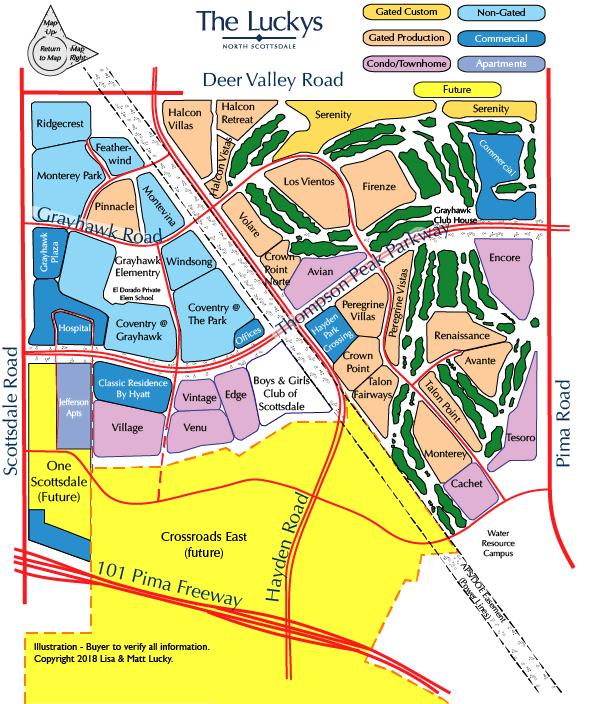 Grayhawk, in North Scottsdale, is a master planned community on 1,600 acres, and features two distinct yet interconnected neighborhoods called The Park and The Retreat. They both offer a variety of prices, amenities and lifestyles. The community consists of more than 4,000 residential units with a broad mix of housing types. There are many community features that give residents a wide range of activities. Parks include playgrounds, basketball courts, picnic areas and grassy play areas. There’s also the Grayhawk Walk trail system, beautifully landscaped for jogging, biking, or just taking a stroll. The Park at Grayhawk caters to family-oriented buyers. The Boys and Girls Club of Grayhawk is located at Thompson Peak Parkway and Hayden. This community center includes a gymnasium, learning center, computer room, arts & crafts room, multi-purpose areas, and a before and after school program for elementary school children. Adjacent to the Boys and Girls Club of Grayhawk is a new City Park with 4 baseball diamonds, 2 outdoor basketball courts and more. Grayhawk Park, a City Park next to Grayhawk Elementry school, has 13 acres, 2 baseball fields, Playground, ramada, 2 full basketball courts, 2 tennis courts, 2 sand volleyball courts, 2 soccer fields, and restroom. The Retreat contains two world-class, 18-hole public golf courses, the Grayhawk club house with superb casual dining, miles of trails for hiking, biking and jogging, peaceful open areas with barbecue pavilions, community tennis courts and swimming pools. All reserved for the private use of Retreat residents and their guests. Guard-gated neighborhoods offer residential choices ranging from luxurious single-family homes and spacious townhouses to spectacular custom home sites. And, many homes with golf course views are available. Plus, Grayhawk’s resident program director maintains a complete schedule of sporting events, social functions and cultural activities that’ll help add fun and friendship to your life at Grayhawk.